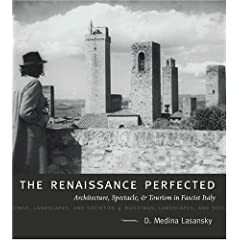 D. Medina Lasansky, The Renaissance Perfected: Architecture, Spectacle, & Tourism in Fascist Italy. University Park: Pennsylvania State University Press, 2004. 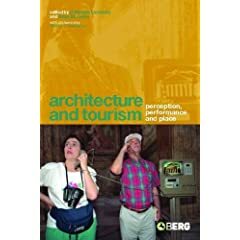 From the preface: “This book examines the way in which the late Middle Ages and Renaissance were manipulated and deployed in service of politics during Italy’s Fascist regime between 1922 and 1945. . . .
Medina Lasansky and Brian McLaren eds., Architecture and Tourism: Perception, Performance, and Place. Berg, 2004. 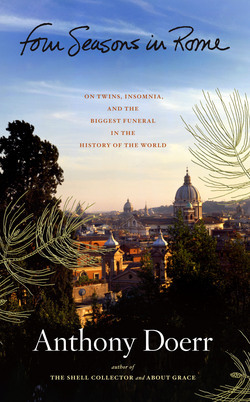 This summer our rhetoric students are using the Rome Eyewitness guide as one of our textbooks. This is a useful book for us both as a basic guide and because it is an interesting example of the art and rhetoric of guidebook making, a tradition that is now centuries old. The guide is fairly comprehensive and it is beautifully illustrated. This comes with a cost — it is expensive and because those beautiful illustrations are on heavy coated stock, it is a heavy book to carry around. Fiona Wild, ed. 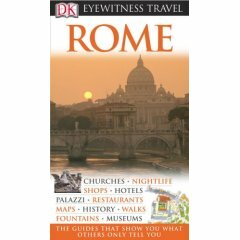 Rome: Eyewitness Travel. London: Dorling Kindersley, 2006. 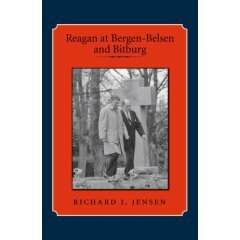 Richard Jensen’s Reagan at Bergen-Belsen and Bitburg has just been published by Texas A&M University Press in its Library of Presidential Rhetoric series. The paperback version is available at Amazon.com for under $15.